Government institution buildings serve both a functional and a symbolic role in every community. Federal and local government units use these structures to administer civil services to the local population. At the same time, government buildings are a reflection of how taxpayer money is being spent. When they’re well-maintained, municipal and government buildings give locals a sense of pride about their community. When left dirty and in disarray, these government properties become signs of administrative incompetence or carelessness. Negative perception from the public is just one of the many repercussions of a poorly maintained municipal office building. Filthy buildings that accommodate large numbers of people every day can become hotbeds for germ and viral growth. Illnesses can start creeping in and affect employee productivity. In worst case scenarios, diseases can be communicated to residents visiting the facility. If your government office is in need of reliable and effective cleaning services from a trustworthy contractor, Valor Janitorial is here for you. We have extensive experience in tidying up and sanitizing government installations across North Texas. 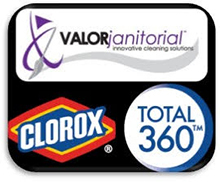 Valor Janitorial provides reliable and trustworthy janitorial services and office cleaning for government offices and buildings in the Dallas-Fort Worth area. Our staff is armed with up-to-date knowledge and state of the art cleaning gear and will get your building back to its spotless glory in no time at all!